On April 11, 1990, British customs officials seized what they believed was to be a barrel for an enormously large super cannon headed for Iraq, presumably to be used to shell Israel and Iran from an immense distance (up to 625 miles) away. Iraq never did get its chance to field a combat ready version of their super cannon, called Project Babylon, but they did get as far as building prototypes for testing, serious cause for concern by the neighbors of Iraq in the Middle East, including Iran and Israel. Iraqi dictator Saddam Hussein was well known for his military aspirations against Iran and Israel, and he fashioned himself as a military leader, often dressing in military uniforms. Hussein had continuously sought to improve Iraq’s military capability and increase his military’s level of sophistication, including developing chemical weapons such as poison gasses and establishing a nuclear weapons program. Hussein’s military aspirations caused alarm both in his region (the Middle East) and in far away places such as Europe and North America that could be adversely affected by a dramatic increase in the price of oil should the Middle East erupt into warfare. Fears of the evil intentions of Saddam Hussein and Iraq were justified by the Iran-Iraq War which had just finally wrapped up after waging from 1980 to 1988, perpetrated by Hussein when he perceived Iran to be weakened from its 1979 revolution. Undeterred by his lack of success with his giant cannon projects, Hussein would go on to invade a smaller neighbor, this time Kuwait, in August of 1990, setting the stage for what became The First Gulf War of 1990-1991. Iraq in green, Kuwait in orange. Map by Izzedine. Prior to the schemes of Saddam Hussein, it was the Germans that were famous for creating gigantic cannons during both World War I and World War II, cannons so large and with such incredible range that they caused fear out of proportion to their actual military (lack of) effectiveness. In World War I the Germans had the Paris Gun built and put into action, a 256 ton monster of 211 mm caliber, but later bored to 238 mm caliber. The gun could launch a 234 pound shell at 5400 feet per second for an incredible range of 81 miles. The trajectory of its payload soared over 26 miles above the Earth on its way to the target. Of course, the fall of shot could not be observed so corrections were next to impossible to make, and the immense distance traveled by the projectile meant the accuracy was only good enough to target a city and nothing more precise. The shells approximated an 8 inch naval shell, and were not large enough to cause serious damage to Paris, serene in its seeming invulnerability 75 miles from where the Paris Gun was staged. Manned by a crew of 80 German sailors (because the largest artillery of the time was found in naval guns), the Paris Gun was well protected by numerous normal sized artillery batteries that provided not only protection from Allied attack, but also meant to mask the monstrous noise produced by firing the big cannon. When the gun finally was used in anger, Parisians thought they were being bombed by some sort of high altitude aircraft or zeppelin, since the shells fell from the sky with no warning. A rate of fire of only about 20 shells per day was possible, and a total of less than 400 shells were fired. Sadly, 250 people lost their lives in the shelling between March and August of 1918, before the giant gun was removed back to Germany. A single shell caused 91 fatalities by itself when it landed on the St-Gervais-et-St-Protais Church during Good Friday services. The gun and its detailed plans were destroyed by the Germans rather than be turned over to the Allies. World War II brought Adolf Hitler onto the scene, a man like Saddam Hussein in his lust for the gigantic and grandiose weapons. Massive battleships and tanks were one thing, but when it came to giant cannons the Germans went all out! An improved model similar to the Paris Gun was conceived and built, called the K 12, this time stationed on railroad tracks to enhance its mobility over the built in place and stationary Paris Gun. A pair of the giant guns were built, weighing 330 and 351 tons respectively, with barrels over 100 feet long. These guns were used at more than 55 miles range to shell the island of Great Britain from bases on the continent. Like the Paris Gun, the K-12’s were 211 mm caliber. The Germans also built and fielded even larger railroad guns, called the K-5 of 283 mm (11.1 inch) caliber, lobbing shells over 40 miles that weighed well over 500 pounds. The Krupp K5 in United States Army Ordnance Museum. Photograph by Superx308. The Big Daddy of all cannons during World War II were the enormous 800 mm caliber (31.5 inch bore!) railway guns called Schwerer Gustav, the biggest guns ever used in combat. The Germans only made 2 of the monsters, as the cost in money, time to build, materials to manufacture it, and men to man it were likewise enormous, far out of proportion to their usefulness. Requiring not a single, but a double rail line to move the 1490 ton cannon, it took 250 men to assemble the pieces on site to get the gun ready to fire, and another 2500 men to lay the double track needed to maneuver the weapon back and forth on a curve in order to aim it. Two anti-aircraft battalions were dedicated to each gun for protection from aerial attack, an attack certain to come for such a high priority target. (Not easy to hide, either!) A major general was in charge of each gun. The massive projectiles weighed 7.7 tons, dwarfing the 1 ton projectiles from our battleships’ 16 inch guns during World War II. Range was over 50,000 yards (47,000 kilometers) or close to 30 miles. Another giant German cannon planned but canceled before completion when the factory was bombed was the Langer Gustav, a 520 mm caliber (20.5 inches) gun capable of lobbing a 680 kilogram shell (1500 pounds) 118 miles, a range sufficient to shell London from France. A planned giant cannon, called the V-3, was to have been built in the ground and never moved, but capable of launching shells that weighed over 300 pounds from France to London, a range of 100 miles. This contraption was to have a barrel at least 130 meters long and be constructed buried deep in the chalk ground of Northern France (Mimoyecques), presumably protected from aerial attack. A total of 25 of these tubes were to be built, each with several booster chambers running the length of the 490 foot long barrel, each firing in turn as the projectile passed the auxiliary chamber, giving the projectile a boost. Using successive charges to launch an extremely long range projectile was not a new idea, and in fact other countries had explored the idea before, as much as 60 years earlier, or even 80 years earlier in its most fundamental form. German engineers had a tough time trying to get the timing of the charges down precisely, and also experienced problems with hot gasses leaking past the projectile while in the smooth-bore un-rifled barrel. The Allies took the threat seriously and developed unmanned drones out of B-24 bombers packed with explosives and radio controlled in order to attack the V-3 site. It was in such a drone that Joseph Kennedy, Jr, older brother of the future President of the US, lost his life, since a pilot was needed to get the drone airborne, before the pilot would parachute out and radio control would take over. Massive 15,000 pound Tallboy bombs were instead used to attack the site, and the Germans abandoned the project before it ever was used in anger. The prototype V-3 cannon at Laatzig, Germany (now Poland) in 1942. 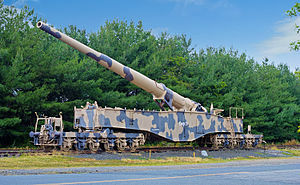 With the development of rockets and missiles and jet bombers, the need for heavy and expensive, but most of all vulnerable giant cannons seemed to fall into the obsolete scrap heap of military history. On the other hand, the idea of using a giant cannon to launch a payload into space, for peaceful or military purposes seemed attractive to the particularly inventive engineers associated with such projects. One such man was Canadian engineer Gerald Bull, an engineer obsessed with the idea of creating a cannon capable of launching a payload into space. Of course, if the cannon could achieve that feat, it could also launch a payload to land anywhere on the surface of the Earth, thus making such a device a potential weapon, even if the builders claimed to be building it for peaceful purposes. Bull found himself in the employ of Saddam Hussein and the Iraqi military, under the pretense that such a gun was to be used for space launches of a peaceful nature. Suspicious British, American and Israeli intelligence agencies thought that Hussein surely planned to attack Israel with such a cannon and decided to prevent Iraq from building such a weapon. Not only did the British put the stop to the export of necessary barrel sections, but an unknown entity, reputed to be the Israeli Mossad, assassinated Bull in Brussels, Belgium, in March of 1990, ending Saddam’s quest for his supergun. Other European countries also seized and confiscated pieces and parts suspected of being destined for inclusion on the Project Babylon cannons. As with the V-3, the “Big Babylon” operating version of the supergun would have been buried in the ground at a hillside, with a predetermined slope to target Israel. Had it been built, it is quite likely Israel or a Western power would have attacked the site. The debacle of invading Kuwait in 1990 and then being forcibly expelled by a large international coalition in 1991 severely hampered Saddam Hussein’s ability to mount large military projects, as Iraq chafed under international observation and sanctions. When the US invaded Iraq in 2003 on the pretense of Hussein having weapons of mass destruction (WMD’s), Hussein was overthrown and Iraq has been in chaos since, no longer in any position to contemplate such grandiose weapons as Project Babylon. Two sections of Big Babylon that have been bolted together at Royal Armouries, Fort Nelson, Portsmouth. Photograph by user:geni. Questions for Students (and others): As we have asked before, is it ever moral or legal to preemptively attack another country you have reason to believe will attack you if you do not attack first? Is it ever morally sound to assassinate a person you believe presents a threat to your national security and safety? What failed super weapon idea do you find most interesting? Please let us know in the comments section below this article. Warren, Kenneth and Great Britain. 2nd Report [Session 1991-92]: Exports to Iraq; Project Babylon and Long Range Guns; Report Together with the Proceedings of the Committee: [Hc]: [1991-92]: House of Commons Papers: [1991-92]. Stationery Office Books, 1992. Zaloga, Steven. 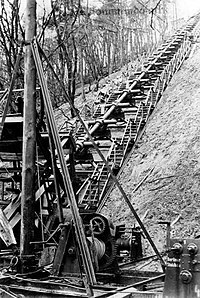 Superguns 1854-1991: Extreme artillery from the Paris Gun and the V-3 to Iraq’s Project Babylon. Osprey Publishing, 2018. The featured image in this article, a photograph by en:User:Bluemoose of a section of the Iraqi supergun (“Project Babylon“) displayed at Imperial War Museum Duxford, is licensed under the Creative Commons Attribution-Share Alike 3.0 Unported license. Subject to disclaimers. Previous ArticleFamous London Landmark is an Imposter! Next Article Most Serious Mutiny of the Napoleonic Wars?